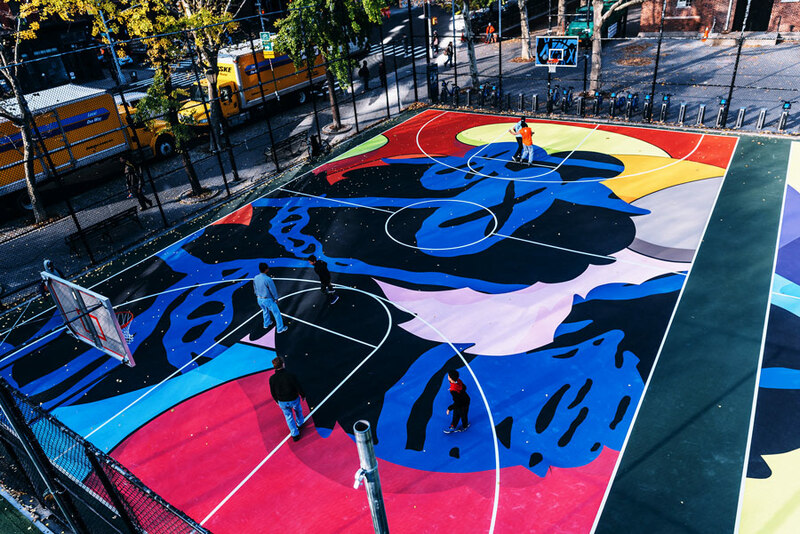 Jeffrey Tubbs was scrolling through Instagram one day when he came across a photo of a new basketball mural by the graffiti artist KAWS. Tubbs, a Co-Founder of MTWB, loved this image so much he was inspired to make it happen in Philadelphia. 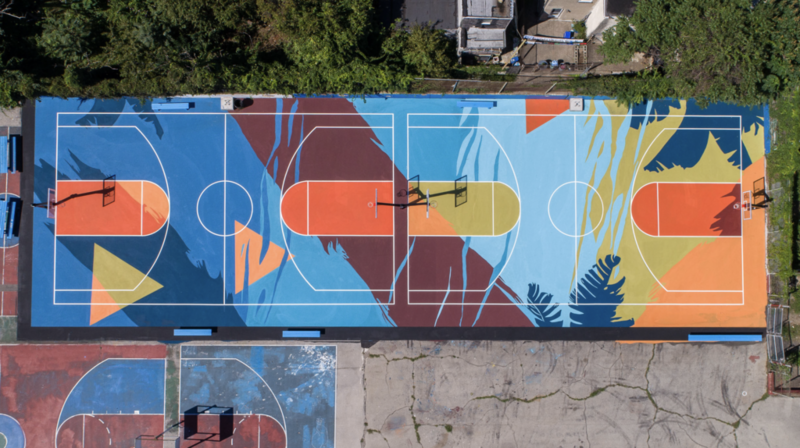 With an enthusiastic YES from Parks & Rec Commissioner Kathryn Ott Lovell and Connor and the team at MTWB on board, less than two years later, Waterloo Playground in West Kensington is now home to Philadelphia’s first official basketball court surface mural. 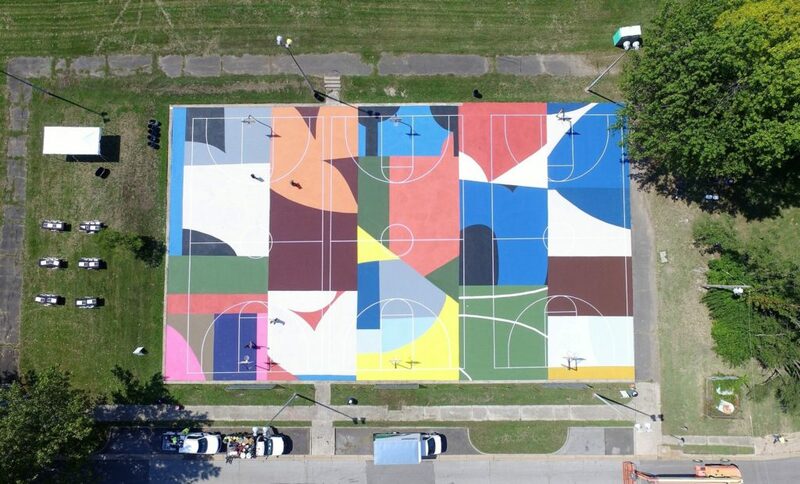 Tubbs reached out to Dan Peterson, the head of LA-based nonprofit Project Backboard that has led the creation of several basketball court murals around the country. Peterson was an early and steadfast champion for advancing the court mural project at Waterloo, helping us work through many details related to the design, engagement and product application. Waterloo Basketball Courts before construction. Once we had the community at Waterloo, Parks & Rec Commissioner Kathryn Ott Lovell and Councilwoman Maria Quiñones Sánchez collectively excited about the concept for the court mural, and the technical support on board, we looked to Mural Arts (our partner for two previous park projects) for the art and design piece. Jane Golden, Mural Arts’ Executive Director, was immediately excited about the project, and enthusiastically recommended Carlos Lopez Rosa (Calo), a visual artists born in San Salvador and now living and working in Philadelphia. 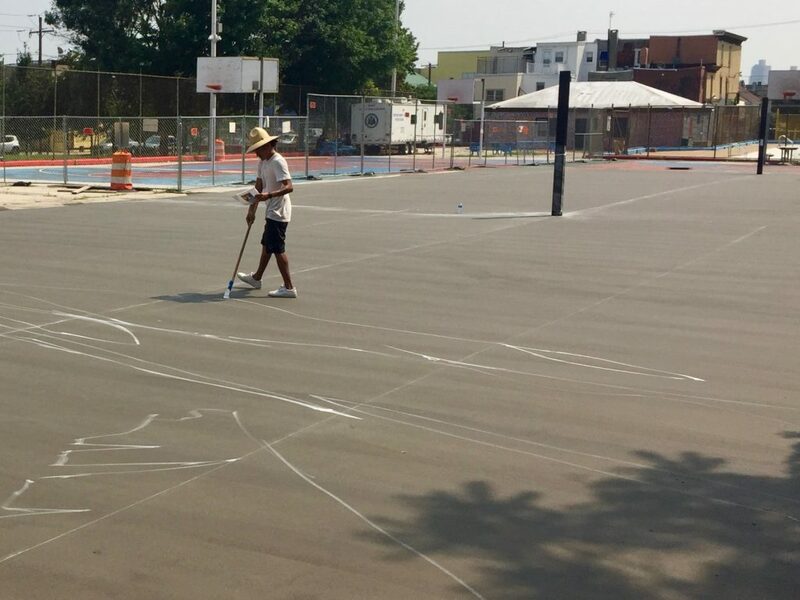 Artist Carlos Rosa outlining his design on the court prior to color application. 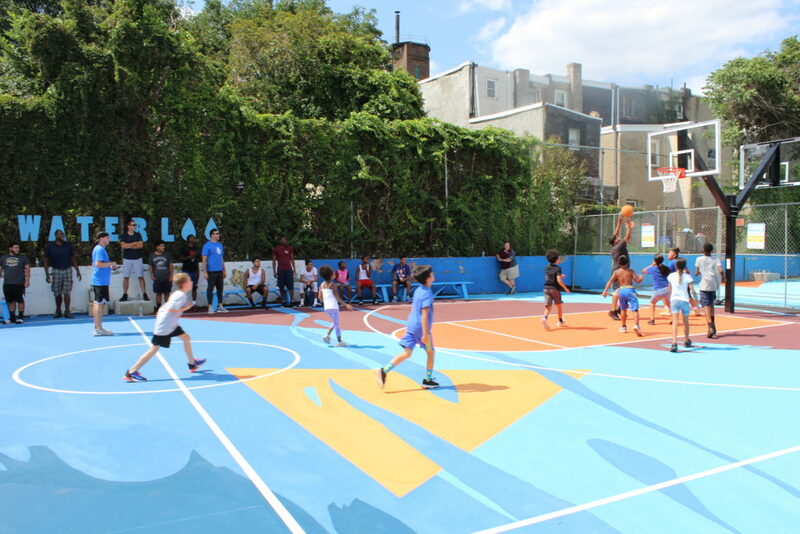 The completion of this project marks the end of Phase 1 of construction at Waterloo Playground. We are very grateful to our sponsors who made Phase 1 at Waterloo possible. 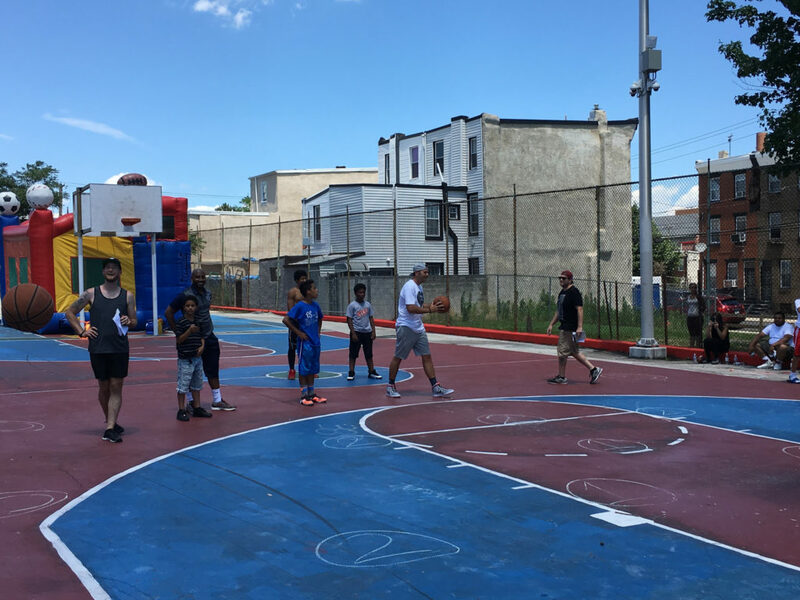 These funders include Jaws Youth Playbook, HealthBridge Chiropractic + partners, William Penn Foundation, City Fitness, lululemon, LISC Home Court & the Mural Arts Program. Phase 2 is expected to kick off later this year and will include both traditional and nature-based play elements, handball wall, pool upgrades, improved gateways and access points, gaming space, picnic areas and green stormwater infrastructure. Make sure to follow us for more real time updates! Check out the drone photography from this project.